Dell PowerVault MD1220 SAS Storage Array DUAL 6GBps Controller and Dual PSU's. In good condition and full working order. 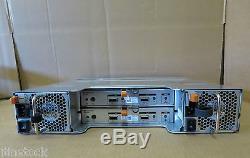 1 x Dell PowerVault MD1220 24-Bay 2.5 SAS Storage Array Chassis. 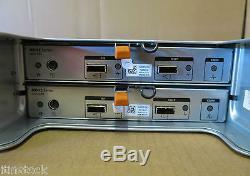 2 x MD12 SAS 6GBps Port Controllers W307K. 2 x Power Supplies 0F884J. Universal 1U Rack Mount Rails. 24 x Dell 2.5 SATA/SAS caddies included. PowerVault MD1220 direct-attached, energy efficient storage array that provides the performance to satisfy demanding applications. Expansion for Performance-Intensive Single-Server Applications. PowerVault MD1220 direct-attached storage array is the second generation of Dell's energy-efficient, small-form-factor (SFF), 2.5-inch drive expansion enclosure. The PowerVault MD1220 offers seamless expansion for Dell PowerEdge servers with PERC H800 Host-RAID adapter, providing IOPs needed to satisfy performance-intensive application. This expansion array can support 24, 2.5-inch SAS hard-disk drives (HDDs) or solid-state drives (SSDs)1 in a 2U array and expands up to 8 arrays per adapter, so you dont have to trade capacity for performance. Optimizing performance, enhancing security while doubling the throughput: The PowerVault MD1220 leverages SAS 2.0 technology, which enables double the throughput over previous generation, with a 6Gb/s SAS interface and offers performance optimization with automatic I/O (input/output) load balancing across redundant paths and enhanced security, over previous generation with new self-encrypting drive (SED) support. Improved efficiency: The PowerVault MD1220 improves energy efficiency over previous generation, with new 80PLUS(R) Silver Certified power supplies. This enhancement augments the efficiencies already gained with 2.5-inch drives and variable speed fans. Satisfying Even the Most Performance-Hungry Applications. The PowerVault MD1220 direct-attached storage array storage array offers compelling performance. Pair the increased IOPs and throughput of 6Gb/s SAS with support for solid state drives (SSD), which have 3x the IOPs performance over 15K SAS. Drives and offer an ideal solution for applications that rely on random block access. Automatic I/O Load Balancing: Further optimizing the performance of the PowerVault MD1220, the PERC H800 Host-RAID adapter has automatic I/O balancing between the server and storage array. The PERC H800 can detect when a single path starts to get saturated and then balance the I/O traffic across both paths. The PowerVault MD1220 direct-attached storage array can deliver the speed, performance and reliability to satisfy performance intensive single server applications that store active and frequently changing information. VAT IS NOT PAYABLE BY PURCHASERS OUTSIDE THE European Union (EU) AND by purchasers in the EU (excluding UK) who are VAT registered. SL 101595 TAG C2VJ35J SLD. The item "Dell PowerVault MD1220 SAS Storage Array DUAL 6GBps Controllers 24 x caddies" is in sale since Wednesday, February 21, 2018.